Doctor Who: Clara Strong | Warped Factor - Words in the Key of Geek. I stood in the hospital, realizing my father needed hospice. I knew I was going to take him home, caring for him until he passed. Everyone said "its too hard" or "put him somewhere," but I insisted. This was my father and it might take everything, but I knew I could handle easing him to the other side. I took comfort knowing he would be strong again, even if without me. Horrifyingly unknown, I knew I could live through the pain and felt honored to take away his. The character Clara Oswald has that kind of strength, too. Ever since The Time Of The Doctor and the good-bye hallucination of Amy Pond, I felt the character of Clara has been short changed. Most recently, I rallied against the Face The Raven, but last week, during Heaven Sent when the Doctor used his love for Clara as fuel to survive the confession dial, I started to forgive Moffat. I knew that in the final moment he was going to resolve her story quite well. Even believing that, I was knocked out by his script for Hell Bent. In it, and by his understanding of love and strength shown by letting the Doctor be weakened (not stoic like Tennant), Steven Moffat blew me away. The regret and the knowledge that knowing her had compromised her best friend, this man wrote a woman whose strength should finally quiet his feminist critics. Clara, from day one, showed how to survive hardship without becoming bitter. Be it her mother or friend's death - long before she entered his timestream, Clara was unrelentingly strong. Every time she sacrificed for the doctor, and when Eleven regenerated through the adjustment to Twelve... she got stronger. Danny Pink became the training ground and foreshadow. Appearing hardened, Capaldi even tricked us into believing he didn't care that much. (Okay, I hear him from last series saying "do you think I care so little for you that your betrayal...." but not giving in until Last Christmas.) Even in his "custody of care" this season, we were getting a dry way of saying devotion - authentic agape, but still it felt a bit short-changed. Developing their connection thru series eight and nine, it was clear that "the risking all for each other" was weakening our beloved Doctor, too. Dangerous for both, we finally saw that Twelve was losing the Doctor - his immortal soul per say - and he was risking all, with much more to lose. Personally, I can not imagine a better ending for the series' longest companion. From her horror at the Time Lords forcing 4.6 billion years of suffering, to her deadpan strength in the diner, Jenna Louise Coleman has forever changed the Doctor, whether he remembers it or not. 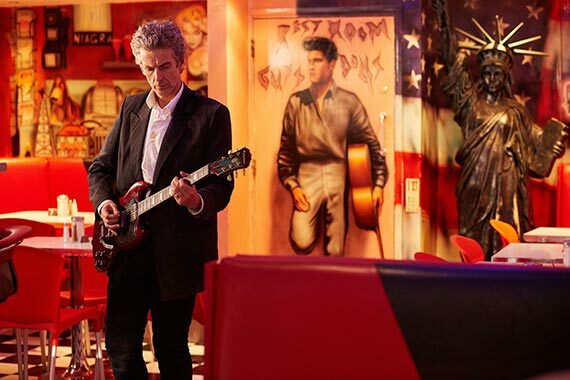 For me, it was Capaldi playing Murray Gold's Clara's Theme on his guitar that broke my heart. Now, we know that Twelve will be fine, niggling thought or not, but Clara finally got the respect the character deserved, and Ms. Coleman has our collective gratitude for putting the Doctor back right for us. Clara is strong enough to spare him another devastating loss, and she did. Just as heartbreaking as Rose, Donna and the Ponds departure, having Clara's memorial peel off the TARDIS was a perfect image for the Doctor's mind as they parted. Bravo writer, director, actors and all. Ultimately, Clara eased the Doctor back into himself and loved him through to the other side. I understand.